NYC – Legendary Jazz-Rock-Fusion band BRAND X has reunited and is preparing to celebrate their reunion with a Fall 2016/Spring 2017 U.S. tour, including a headline performance at Progtoberfest in Chicago on October 21st. Also on this initial run will be shows in Milwaukee, Detroit, Cleveland and Boston to name a few. Many claim it’s BRAND X’s unique combination of masterful chops mixed with their childlike melodies that make so special. Some musicians play from inside their own world, but John Goodsall, Percy Jones, Kenwood Dennard and the guys from BRAND X play from their own universe! London, UK – Although typically considered an off-shoot band for Genesis legend Phil Collins, UK prog-fusion group Brand X was much more than that. 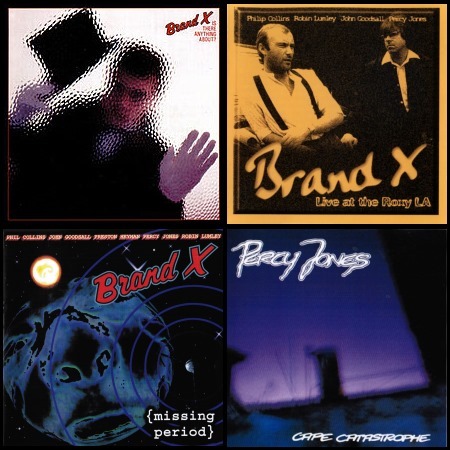 Featuring several virtuosic musicians (as well as Collins), Brand X took the genre of fusion to a whole new level of expertise. Along with Collins on drums, the band featured Percy Jones (bass), John Goodsall (guitar) Robin Lumley (keyboards), and Morris Pert (percussion), with sometimes Mike Clark, Kenward Dennard (drums), and John Giblin (bass). Active from 1975-1980, Brand X was another one of those bands who were beloved by other musicians, and the more discerning critics, but despite everything never had the commercial success they deserved. The band released several critically acclaimed albums on the Charisma label in the UK and Passport label in the US, including ‘Unorthodox Behaviour’, ‘Moroccan Roll’, ‘Livestock’ and ‘Product’. Now much to the excitement of Brand X fans and fusion music fans worldwide, Gonzo Multimedia is releasing 3 rare Brand X titles on CD (Missing Period, Live At The Roxy LA 1979, Is There Anything About? ), as well as bassist Percy Jones’ hard to find solo offering from 1989 ‘Cape Catastrophe’.